Trip To Reno Via Crater Lake ! Bekah and I set out for Phoenix a day early since the weather in Seattle was meant to deteriorate over the weekend. First stop was Reno and made it down here no problem, got a bit bumpy in the Reno valley as expected, I don't think the air is ever smooth down here. Anyway, Seattle to Reno in 3.5 hours, not bad. 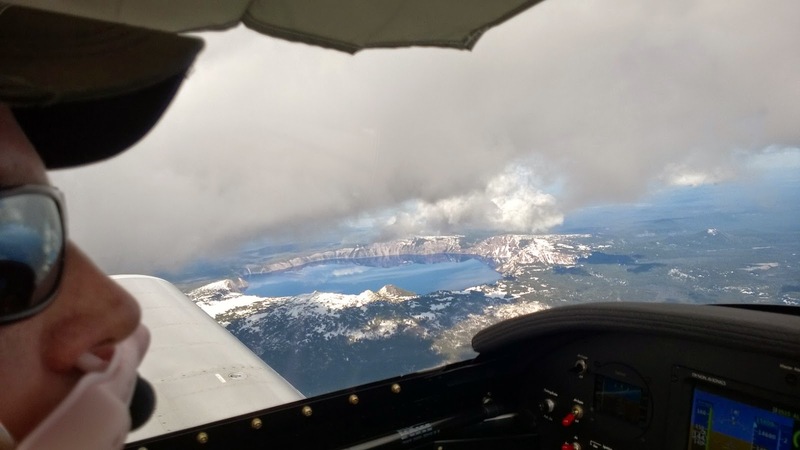 I filed IFR Flight plan and had some build up over the mountains as we were passing crater lake. I asked for slight deviation since I was a bit concerned about icing since we were already at 15K and we were able to stay clear of the clouds, and got some peek a boo views of Crater Lake. Once we got down in Reno I tied the plane down good and stowed the control surfaces with the seat belt. Very glad I did because there was a Dust Storm of all dust storms last night. I was really horrified about the fact that my plane sat through a dust storm, but I don't think there will be any lasting effects. My biggest worries are the canopy and the air intake on the engine. Will go and make sure all is clean today as we are out and about, then tomorrow 6:00am we are off to Phoenix.